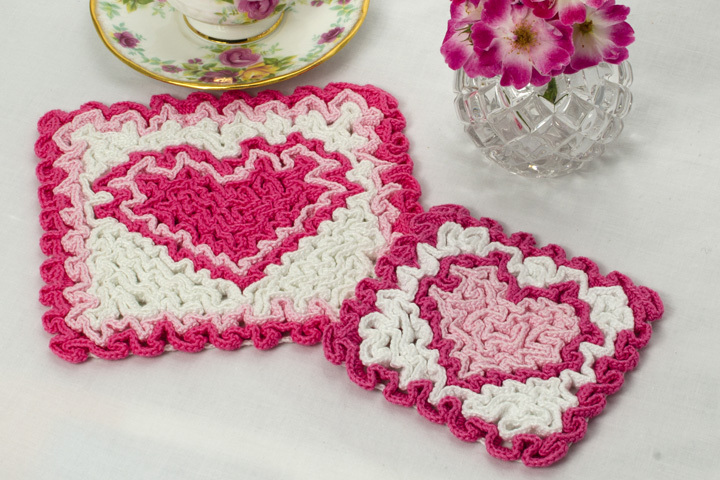 What could be nicer for Valentine’s Day than to include this wiggly crochet hot pad and coaster in your holiday décor (well, flowers and chocolates would be nicer, but they don’t last as long)? The hot pad is perfect for your Valentine’s Day meal hot dish while the coaster keeps surfaces unharmed from water rings. And they make great gifts, too! The pattern includes 2 wiggly crochet charts: one for the hot pad and one for the coaster, as well as written instructions and a brief tutorial on doing wiggly crochet.